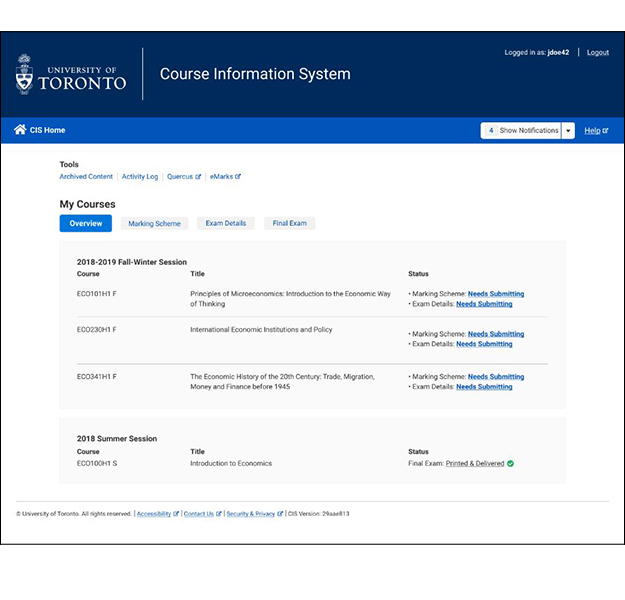 The Course Information System (CIS) is kicking off the New Year with a new look and feel – ready to save U of T faculty and administrators hundreds of hours of work. After three months of usability testing and a survey conducted in early December 2018, CIS will display a redesigned homepage and other functional screens starting March 2019. CIS was first developed with essential functionality for select units. 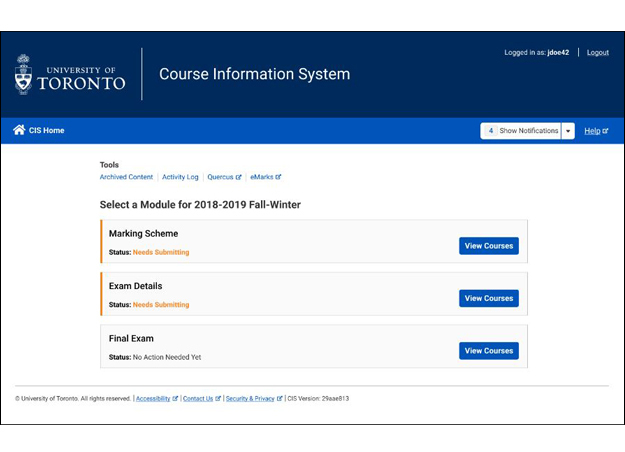 Now it has been redesigned for a further expansion of its features and a broader user base, including new academic units across U of T. It streamlines syllabi and exams processes for instructors and administrators. The system, created by EASI in partnership with the Office of the Vice-Provost, Innovations in Undergraduate Education, is currently being piloted in three divisions on two campuses. It is divided into three modules for instructors to submit syllabi-related materials, pre-exam and final exam details. To create the redesign, the EASI user experience and process design team conducted extensive one-on-one interviews and usability tests followed by a survey sent to all CIS users. The survey asked users to vote on the three different options by ranking them overall, critiquing specific aspects of each concept, and inviting optional long-form qualitative feedback on what respondents thought of each concept. One option featured the task areas in CIS. 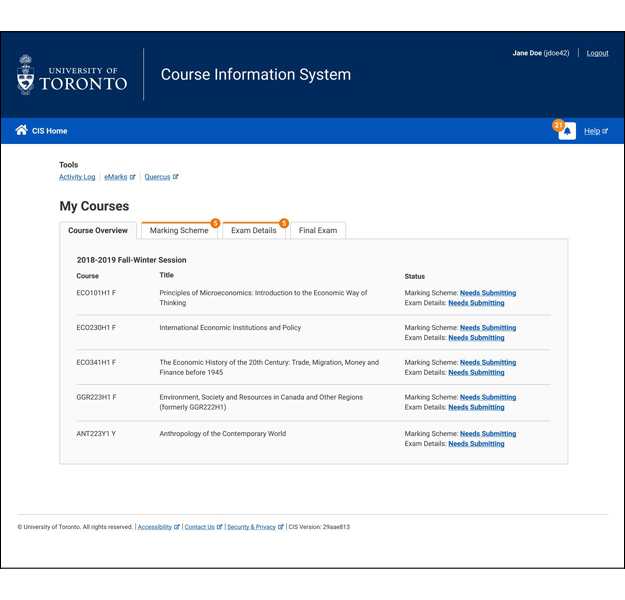 Another option featured a tab-based navigation with courses at the forefront. At the end of the extensive research process, users preferred the option with tabs in the navigation and a workflow based on their courses. 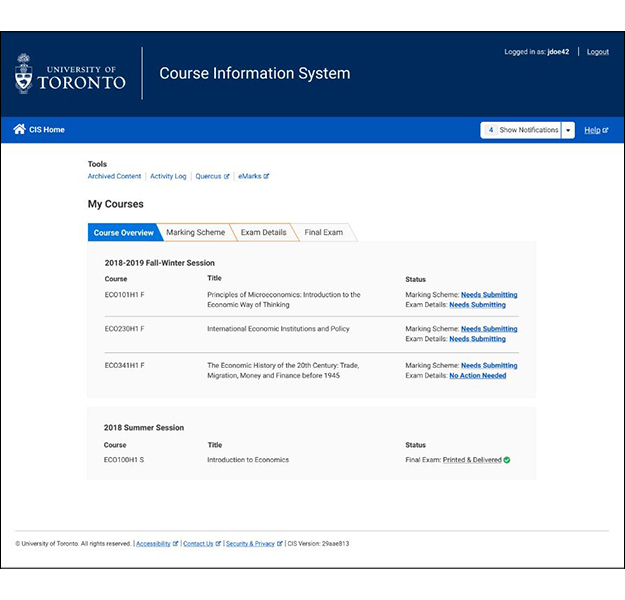 The final, preferred option, featured a different tab design with courses at the forefront. After receiving and analyzing all of the feedback, the team then integrated it into an improved final design. The simple design indicates the statuses of an instructor’s course content and what actions are required. In the future, two more undergraduate divisions will be onboarded to the system in summer 2019. The team will also focus on developing an administrative interface to allow divisions to manage their own data within the system.